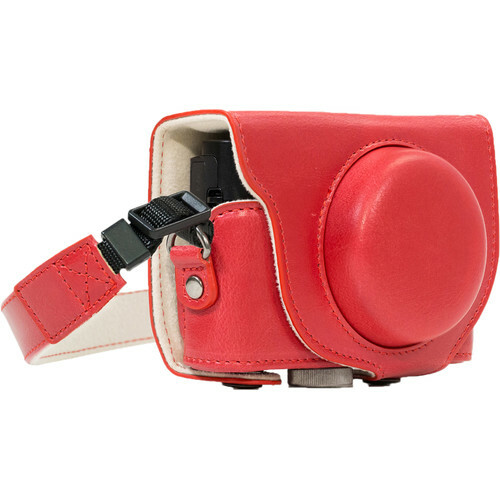 Give your Sony Cyber-shot DSC-RX100 VI, DSC-RX100 V, DSC-RX100 IV, or DSC-RX100 III a touch of elegance, while also protecting it from dirt, scratches, and bumps with the Ever Ready PU Leather Camera Case and Strap in red from MegaGear. This two-piece case consists of a top and bottom, and it has a matching shoulder strap. The bottom may be used independently as a half case, and attaches to the built-in tripod mounting screw. This screw is threaded on the bottom for convenient tripod usage without having to remove the case. The top piece completes the all around protection and attaches with snaps. For style, this case has attractive stitching reminiscent of old world craftsmanship while its leather-like, sustainable, polyurethane material reflects new world ecological sensibilities. Made of the same polyurethane, but with a suede-like finish, the interior softly caresses your camera while also protecting it from scratches.